While looking for a home on Maine’s premier sailing waters Sam Rowse discovered the Carriage House, a run-down stone castle-like structure in Camden. The New Hampshire resident was drawn to the turreted building because of “its uniqueness, its history, the work required to restore it and its proximity to Penobscot Bay,” Rowse says. 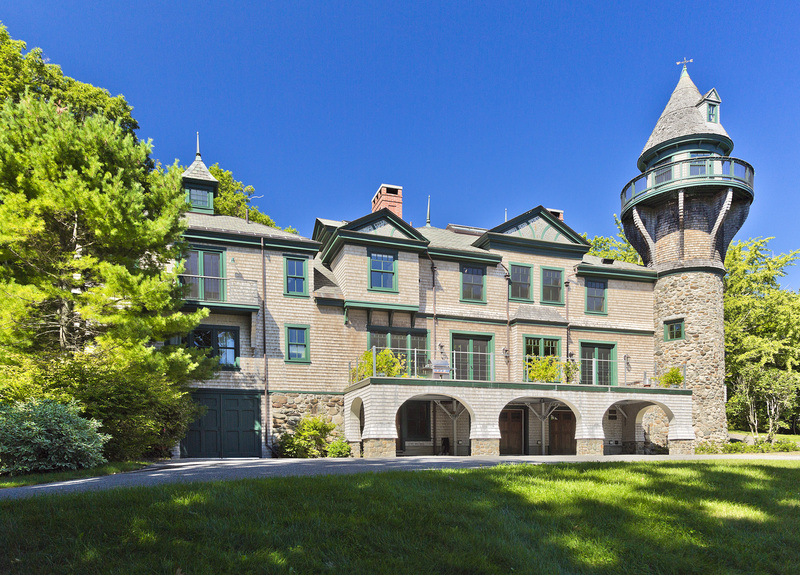 The Carriage House was constructed in 1890 as an accessory building for Norumbega, the estate of Joseph Stearns, who invented the duplex telegraph system. The mansion is now The Norumbega Inn. In 2007 Rowse, who recently retired from his family’s water and juice business, gutted the Carriage House and converted it to a residence. Now he is seeking another project, so he put his 2.4-acre property on the market for $3.74 million. The 5,656-square-foot house has five bedrooms, 4-1/2 baths, a four-car garage and access to the Norumbega neighborhood’s nearby beach on Sherman Cove. The architect retained the open interior, exposed the roof trusses and replaced them with steel beams sheathed with Douglas fir. A second set of studs was installed and the resulting 9- to 10-inch-thick exterior walls were insulated. Throughout the house stone, marble tile and Southern yellow pine flooring and paneling predominate. Custom detailing — down to nickel-trimmed cast-iron stoves and period chandeliers — combine with state-of-the-art amenities and solar-powered heating systems to create a vintage ambience with contemporary overtones. Steel beams sheatherd with Douglas fir support the loft surrounding the central open space. The kitchen is tucked behind one of the chimneys, near the foyer and dining area. The original enameled Glenwood gas stove and an apartment-size sibling offer 10 burners, assorted warming shelves and drawers that Rowse appreciates when entertaining. Southern pine sheaths the modern appliances, so they blend with the custom cabinetry, inspired by the late architect Edith Wharton. The marble island top, counter and floor enhance the period look. One bedroom with an en suite bath, two bedrooms sharing a connecting bath and an office suite occupy the ends of the house. The house shares a 50-foot pebble beach on Sherman Cove. Upstairs, each room’s vaulted ceiling follows its roofline. The master suite’s exposed cypress beams were salvaged from a 100-year-old vinegar tank. French doors open to the east- and west-facing balconies. Double doors conceal the master bath. Surrounding the central living room is the main loft, decorated with wood-burning stoves and antique chandeliers suspended on fishing boat chains. At ground level are the garage, a foyer with a wood-burning pizza oven, a shower room and a sauna. All three levels can access the turret, where the original oak stairs spiral up to the top for “a lovely view of Penobscot Bay,” Rowse says. Utilities include city water and sewer. Annual taxes are about $18,200. Kimberly Swan of the Swan Agency Sotheby’s International Realty, Bar Harbor, Maine ( kimberly.swan@sothebysrealty.com | www.swanagency.com) lists the property.